The analysis of actinides and radiostrontium in animal tissue samples is very important for environmental monitoring. There is a need to measure actinide isotopes and strontium with very low detection limits in animal tissue samples, including fish, deer, hogs, beef and shellfish. 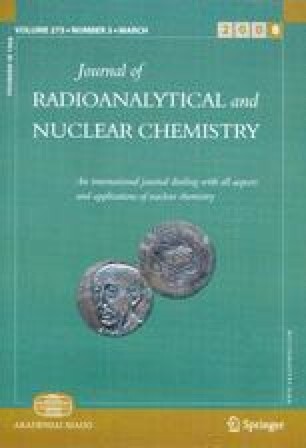 A new, rapid separation method has been developed that allows the measurement of plutonium, neptunium, uranium, americium, curium and strontium isotopes in large animal tissue samples (100–200 g) with high chemical recoveries and effective removal of matrix interferences. This method uses stacked TEVA Resin®, TRU Resin® and DGA Resin® cartridges from Eichrom Technologies (Darien, IL, USA) that allows the rapid separation of plutonium (Pu), neptunium (Np), uranium (U), americium (Am), and curium (Cm) using a single multi-stage column combined with alphaspectrometry. Strontium is collected on Sr Resin® from Eichrom Technologies (Darien, IL, USA). After acid digestion and furnace heating of the animal tissue samples, the actinides and 89/90Sr are separated using column extraction chromatography. This method has been shown to be effective over a wide range of animal tissue matrices. Vacuum box cartridge technology with rapid flow rates is used to minimize sample preparation time.